Can I Carry Liquids in My Checked Baggage? You can carry liquids in checked baggage, but you will have to do some research and take precautions. First, you must find out which liquids are not allowed on airplanes regardless of where you pack them. The Transportation Security Administration (TSA) has a list of these prohibited liquids on its website. You should also look at the Federal Aviation Administration's list of hazardous materials. Never try to bring prohibited materials with you when you fly. Next, you must determine whether you can bring the liquid items to your destination. If you plan to carry several bottles of wine, for instance, you may not be able to bring them into certain US states due to liquor import regulations. Travelers flying to or from Canada will want to read the Canadian air travel regulations, and visitors to the UK should read the United Kingdom's list of items you may carry in hand (carry-on) and hold (checked) baggage. Your next step is to decide whether you want to pack colored liquids, such as red wine or nail polish, that could damage your clothing. Carrying any colored liquid can be risky. Decision-making factors include whether these items are available at your destination and whether your itinerary is flexible enough to allow you to purchase them locally rather than bring those liquids with you. 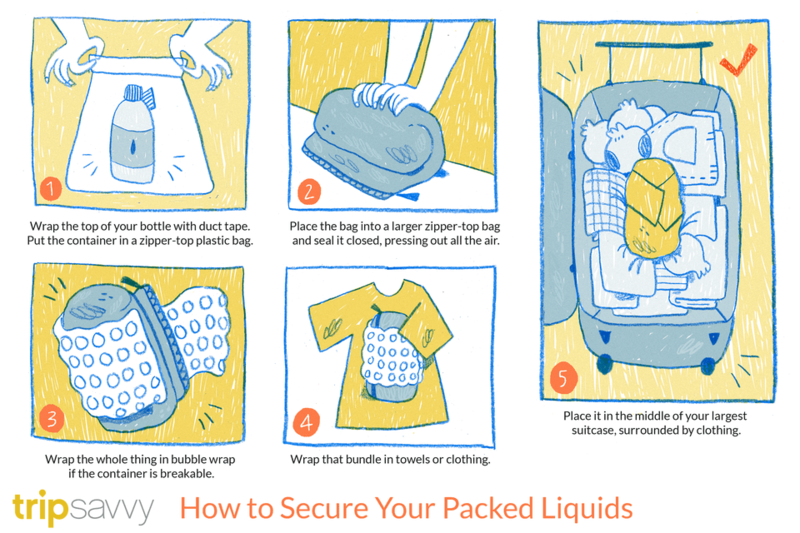 Finally, you will need to carefully pack your liquid items so they will not break or leak. There are several ways to accomplish this. To prevent leaks, wrap the top of your bottle or container with duct tape so the cap stays on. (You may want to pack a small pair of sharp scissors in your checked bag so you will be able to remove the tape later.) Put the container into a zipper-top plastic bag and seal the bag closed. Next, place that bag into a larger zipper-top bag and seal it closed, pressing out all the air as you do so. Wrap the whole thing in bubble wrap if the container is breakable. Finally, wrap that bundle in a towel or in clothing. (Many travelers suggest using dirty laundry for this.) Place the wrapped bottle or container in the middle of your largest suitcase, surrounded by clothing and other soft items. A variation on this method involves using a hard-sided plastic or cardboard container to protect your liquid item. Use a small cardboard box or a sealed plastic container. Double-bag the liquid item as described above. Then, place it in the container and pad it with crushed newspapers, plastic air pillows or crumpled plastic grocery bags. Tape the box shut and pack it in the center of your suitcase. You can buy styrofoam or bubble wrap "shippers," which are sealable padded bags. Brand names include the inflatable VinniBag or the Wine Mummy. Boxes made especially for transporting glass and liquid items are another option. Your local wine shop or pack-and-wrap store may carry shippers. Be aware that the bubble wrap bags will keep escaping liquid from staining your clothes, but may not prevent glass bottles from breaking. The box shipper will take up more room in your luggage. While it may not prevent liquid from escaping, the box shipper minimizes the risk of breakage. Protect your liquid items by placing them in the middle of your suitcase, completely surrounded by clothing and other items. Be aware that your suitcase could be dropped or crushed, perhaps more than once, on its way to your destination. It may even be dragged on the ground behind a luggage cart. If you can choose from several suitcases, pick the one with the stiffest sides and pack it as tightly as you can to better cushion your liquid items. If you pack liquid items in your checked bag, assume that your bag will be inspected by a baggage security screener. The screening officer will see your liquid item on the baggage scanner and will probably need to take a closer look at it. Do not pack valuables, even liquid ones, or prescription drugs in your checked baggage. You can safely carry liquid items in your checked baggage – most of the time. Careful packing and padding will increase your chances of success.